The moon is not a planet, but a satellite of the Earth. Only 59% of the moon's surface is visible from earth. 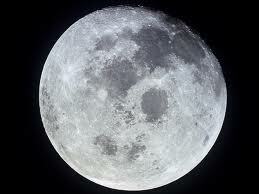 The moon rotates at 10 miles per hour compared to the earth's rotation of 1000 miles per hour. When a month has two full moons, the second full moon is called a blue moon. Another definition of a blue moon is the third full moon in any season (quarter of year) containing 4 total full moons. From Earth, we always see the same side of the moon; the other side is always hidden. The dark spots we see on the moon that create the image of the man in the moon are actually craters filled with basalt, which is a very dense material. The moon is the only extraterrestrial body that has ever been visited by humans. It is also the only body that has had samples taken from it. The first space craft to send back pictures from the moon was Luna 3 (built by the Soviet Union) in October 1959. The moon has no global magnetic field. The moon is about 1/4 the size of the Earth. The dark side of the moon is a myth, in reality both sides of the Moon see the same amount of Sun however only one side is ever visible from the Earth. The Moons gravity is a major factor in the cause of the Earth’s tides. The most commonly accepted hypothesis is the Moon was formed by an impact of a Mars sized object with a young Earth. In 1985 during the Cold War the USA considered detonating a nuclear bomb on the Moon. When Neil Armstrong took that first historical step and said "That's one small step for man, one giant leap for mankind" it would not have occurred to anyone that the step he took in the dust of the moon was there to stay. It will be there for millions of years because there is no wind on the moon. That is, assuming the downdraft from the Command Module upon takeoff back into space didn't destroy the print. Buzz Aldrin reportedly saw the American flag, much further away, blow over during launch. Nevertheless, any footprints made by the famous astronauts undisturbed by takeoff are, in fact, there to stay. When Alan Sheppard was on the moon, he hit a golf ball and drove it 2,400 feet, nearly one half a mile. In a survey conducted in 1988, 13% of those surveyed believed that the moon is made of cheese. The multi layer space suits worn by the astronauts to the moon weighed 180 pounds on earth, but thirty pounds on the moon due to the lower gravity. How close can you get without completely running out of gas? Apollo 11 had only 20 seconds of fuel left when they landed on the moon. Apollo 15 was the first mission to use a lunar rover. The top speed that was ever recorded in this 4-wheeled land vehicle was 10.56 miles per hour. It is possible to have a month without a full moon. This occurs in February, but either January or March will have two moons. In China, the dark shadows that are on the moon are called "the toad in the moon". The Apollo missions brought back 2196 rock samples weighing 382 kg in total.